The symmetrical villa comprises a main two-storey building, a flat lawn, and a pair of open-sided thatched pavilions (one for dining and the other for lounging) situated on either side of a 17-metre swimming pool. The main building comprises a living and dining room with an integrated bar flanked on either side by two-storey wings containing the five bedrooms and the kitchen. The two master bedrooms are situated upstairs in each wing, both with balconies overlooking the sea. Accessed via doors from the master bathrooms is a rooftop deck. The indoor living and dining room offers either air-conditioned comfort or a fan-cooled tropical living experience with floor-to-ceiling glass doors open to the garden. The spacious lounge is comfortably furnished with sofas and a wall unit showcasing artefacts and supporting a 62-inch flat-screen with satellite-channel TV, DVD, Xbox and Playstation. The dining area has a beautiful wooden table for 12 lit by bell-jar lanterns; next to this is a bar counter overhung with copper lanterns. Situated beside the swimming pool, the charming lounge pavilion is open sided and furnished with water hyacinth sofas and coffee tables. A perfect escape from the sun by day, and gently lit at night by bell-jar lanterns, the room is equipped with ceiling fans and a large satellite-channel TV, which sits behind sliding screen doors. Paired with the lounge pavilion but situated at the opposite end of the swimming pool, the dining pavilion is furnished with a table for 12 and offers a semi-alfresco dining experience which is truly magical at night accompanied by sea breezes and the sight and sound of rolling waves. Everything has been considered for the comfort of the guests with ceiling fans, lanterns and two adjacent washrooms. The rooftop deck is the perfect place for a sunset cocktail. Accessed via the two master bathrooms it can be enjoyed as a private space or shared with all of the guests in the villa, with the provision of beanbags and sofas and a low table under the open sky. The 17 x 5-metre swimming pool is bordered by a wide timber deck furnished with eight sunbeds shaded by umbrellas. Within the pool, a sculpture flanked by fire bowls looks beautiful after dark. The garden is planted with giant ‘elephant ear’ taro leaves, and sweet-scented frangipani trees. Between the pool and the main villa building is a wide flat lawn that makes the perfect setting for weddings and events. The two master suites are situated upstairs in separate wings, offering spectacular sea views from their four-poster king-size beds and from their breezy balconies, which are beautiful spots for relaxing in private. Guests can enjoy satellite-channel TVs and DVD players, walk-through dressing rooms, and air-conditioned bathrooms with an indoor and an outdoor shower, as well as a rooftop soaking tub. Two guestrooms lie at the front of the main building on the ground floor, are furnished with king-size beds that convert to twins, and equipped with satellite-channel TVs and DVD players. Glass doors slide open to terraces overlooking the garden and pool while walk-through dressing rooms lead to air-conditioned bathrooms fitted with a shower, and courtyards with a bathtub and shower open to the sky. With twin beds that convert to a king, and a satellite-channel TV and DVD player, the guest room to the rear of the ground floor is well suited for children. The air-conditioned ensuite bathroom, fitted with a rain shower, leads to a courtyard with a bathtub and another shower open to the sky, as well as a secret outdoor sitting area. Even though this room doesn’t have a sea view, the sound of the waves is ever-present. Seseh village, south-west Bali, Indonesia. 10 guests (5 bedrooms: 2 with king-size beds; 3 twins convertible to kings). 2 additional beds available for an extra charge. Air-conditioned living and dining room with table for 12; outdoor dining pavilion with table for 12; lounge pavilion; rooftop terrace. 17m x 5m x 1.3m. Shared between Seseh Beach Villas I and II are a villa manager; private chef; villa attendants; security; gardener and maintenance team. Additional staff (babysitters, masseuses) available on request. Western, Asian, vegetarian, healthy choice and children’s dishes available. Requests accommodated (including special diets and barbecues). Grocery cost is charged 20% handling fee which is subject to service and tax at the prevailing rate. Satellite TVs in all rooms; DVD players; iPod docks in each room (Bluetooth or cable through Sonos system); Xbox; PlayStation; Wii. 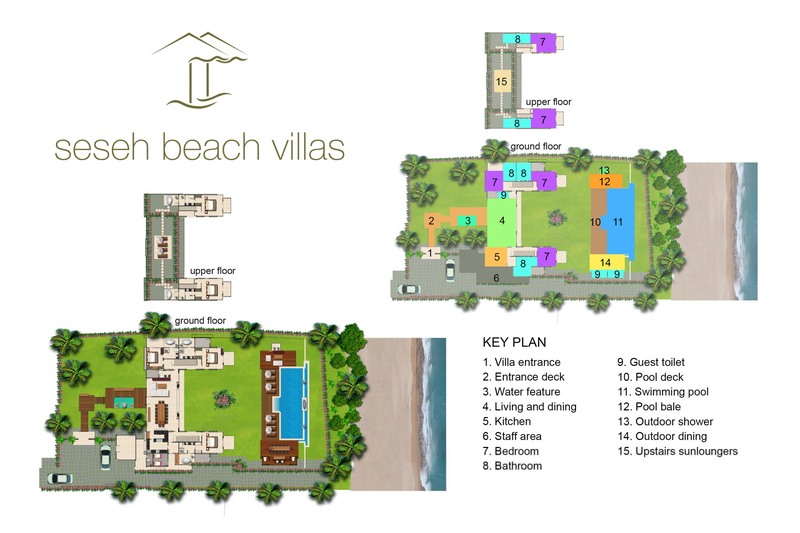 Seseh Beach Villas are well equipped for families. Facilities include a baby cot and high chair, PlayStation, Xbox and Wii. In villa treatments selected from a comprehensive spa menu can be carried out by professional beauty therapists (extra cost applies). Airport pick up and drop off is included and a complimentary 7-seater car is available to guests for up to 8 hours a day (petrol extra). Seseh Beach Villas are perfectly located and set-up for weddings and special events. Parties of up to 70 people can be arranged at the villa with prior notice. Barbecue; diesel powered back-up generator; safety deposit box.